Unless you’ve spent a bundle to max out your Mac Pro with a couple pairs of 16GB RAM sticks, there’s a good chance you’ve experienced the occasional OS X slowdown. 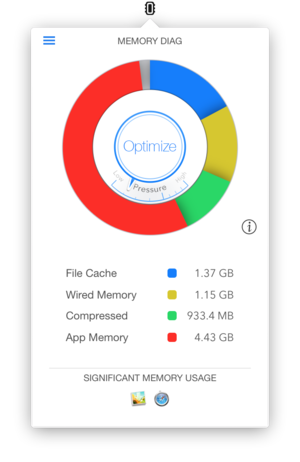 Even with Mavericks’ smart memory management, apps can still leak precious resources, causing all but the newest Macs to feel downright sluggish at times. Memory Diag won’t necessarily take away these issues, but it’ll help you pinpoint your trouble, contain the problem and get back to work. Apple has always offered a way to track memory usage in Activity Monitor, but Memory Diag takes that data out of the app and puts it into the menu bar. A tiny thermometer icon gives you an approximation of how much RAM is being used by your system, and you’ll find a wealth of information after clicking on it, most notably a color-coded pie chart that breaks down your memory allotment and tells you which apps are doing the most damage. 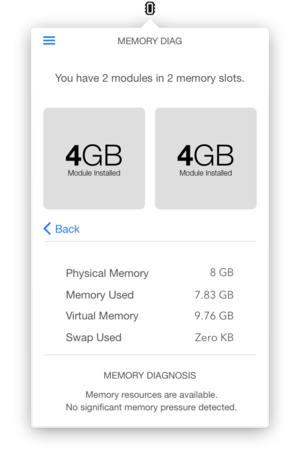 A second screen shows a summary of the available memory and the amount of RAM installed in each slot, though it would be more useful if it listed the type, too. Along with identifying the worst offenders, Memory Diag’s best feature is its ability to quickly optimize your RAM usage. Tapping the center button purges any unused and unnecessary processes that may be gumming up the works. It mostly did well to quickly ease my system’s minor memory strains, but unfortunately it doesn’t work when usage is at critical levels. I expected resource-intensive apps like Photoshop and iPhoto to routinely show up as RAM hogs, but the app helped me identify that Safari was using quite a bit, too; resetting the browser and regularly optimizing my memory helped bring down the consumption considerably, and I’ll be using Memory Diag from here on out to keep tabs on it.